I have been watching all the classic Doctor Who episodes – all 26 years of episodes in order from 1963-1989; a multi-year mission I have set for myself, I have to admit – when I came across this wonderful cultural crossover between Doctor Who and the Alien films from an episode featuring the Sixth Doctor played by Colin Baker entitled “The Trial of a Time Lord: Mindwarp” from 1986. 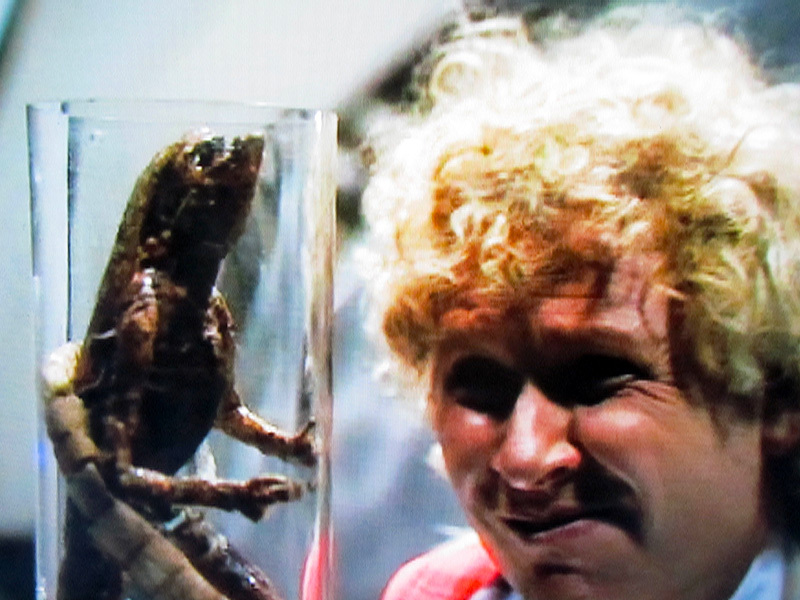 The Doctor and his assistant, Peri, are investigating the laboratory of a renegade scientist performing illicit medical experiments on captive peoples and wildlife when the Doctor comes upon this preserved specimen of a Xenomorph chestburster from the 1979 film Alien. The Doctor picks the container up with a look of disgust before setting it aside. It’s a quick throwaway moment but it was fun to unexpectedly see the two worlds and their messy biological misadventures come briefly together. I just watched the very first episode. So bizarre. The Aztec warriors fought like mimes on lethal doses of Benadryl.. Still, that’s a plus. It contributes to the defamiliarization. The Aztecs is actually the sixth episode. The first episode is The Unearthly Child with a bunch of cave men followed by a classic, the introduction of the Daleks in episode two.